The recent discovery by Barbara Frale that in 1308 Pope Clement V secretly absolved the last Templar Grand Master Jacques de Molay, and the rest of the leadership of the Knights Templar, from charges brought against them by the Medieval Inquisition was barely reported in Malta but it proved the theory expounded in 2006 by Maltese writer George Gregory Buttigieg as correct. In his Of Craft And Honour And A Templar's Chronicles, Dr Buttigieg then seemed to be going against the grain of popular opinion. His theory maintained clearly and loudly the Templar's innocence with regard to the accusation of heresy and rejection of Christ. His book appeared close after the "Da Vinci" wave. Dan Brown had taken the opposite view, namely that the Templars were keepers of dangerous knowledge on the divinity and humanity of Christ who was supposed to have fathered children by Mary Magdalene. According to Mr Brown this was the real reason why the Templars were arrested and destroyed in 1307. "Wrong!" seemed to shout Dr Buttigieg who in his Of Craft And Honour, published by Miller Publications, maintains that the Templars were destroyed by the King of France who arm-twisted Pope Clement V into suppressing the Order on a trumped up charge of heresy. Before these two books were published, a centuries-old historical controversy had raged about whether the Templars were truly heretic or not. Dr Buttigieg too was inspired by this story and painstakingly researched the 1307 - 1312 period of the Templars' destruction. Prof. Frale's discovery once again puts the spotlight on the Chinon Parchment, a historical document first published by Étienne Baluze during the 1600s, in Vitae Paparum Avenionensis (Lives Of The Popes Of Avignon). The parchment is dated Chinon, 1308, August 17 - 20 and the Vatican keeps an authentic copy with reference number Archivum Arcis Armarium D218, the original having the number D217. Detailing the trials of the Templars - Processus Contra Templarios, the Chinon document contains the record of the papal hearing of the Templars' leaders, namely Grand Master Jacques de Molay, Geoffroy de Charney, Preceptor of Normandy, Hugo de Perraud, Preceptor of France, Geoffroy de Gonneville, Preceptor of Aquitania and Potou, and Raymbaud de Caron, Preceptor of Outremer. This publication of the minutes of the hearing, which took place in August 1308, had been suppressed by the French king, as the records clearly reveal that Clement V absolved the Grand Master and the other four of high charges of heresy. Prior to this discovery, this historically-unique parchment had only been suspected of existing, being referred to in a letter, itself preserved in the French Chancery. The Chinon parchment vindicates Dr Buttigieg's expressed views on the Templars for the document does reveal papal absolution from heresy for the Grand Master of the Order and the chief administrators, whose trials have now been made available to and one all with the publication of the Chinon parchment. Dr Buttigieg admits that his Of Craft And Honour, although published after Mr Brown's Code, was written before he even heard of Mr Brown. While Mr Brown wrote an excellent fiction book, one must learn facts from academia in order to form opinions based on the truth, not from bestsellers. Available academic sources had already made it substantially clear that the Pope was neither a prime mover in the Templar arrests nor was he particularly happy that the members of a monastic military order, under his direct responsibility, had been arrested by the French king. Clement's repeated attempts to stop the legal process of interrogation and transfer it to ecclesiastical hands, where it belonged, are a clear indication. There were also historical reasons why the French king would benefit from the Templars' destruction, including the great amount of money he owed them, the properties he tried to inherit after their dissolution, his dream of being a great leader - Rex Bellator - of the unified and massed orders of military monkhood and to lead them into Crusade - a dream fired by the Catalan mystic Ramon Lull. 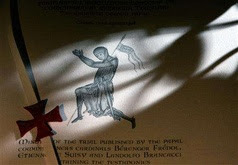 Professional historian and world-acclaimed Templar expert Malcolm Barber, of Reading University, made distinctive reference to this point of head-on collision between the two books and what they implied when he evaluated Of Craft And Honour. Prof. Barber refers to Dr Buttigieg's Templars as a different breed altogether from the Templars in The Da Vinci Code. He points out that Dr Buttigieg speaks of Templars with human and individual faults and weaknesses in contrast to Mr Brown's keepers of a secret doctrine threatening the Catholic Church. The difference is irreproachable and has deep philosophical, religious and metaphysical implications. For Dr Buttigieg, Pope Clement V was constrained by the French king in helping him dissolve the Order of the Temple whereas for Mr Brown destruction came from the Vatican to silence dangerous knowledge and the French king played along. Dr Buttigieg reminds us that the French king had even manoeuvred the very election of Bertrand de Got to the papal throne as Pope Clement V, using his many transmontane cardinals. In 1307-1312, it was time to repay that debt. Dr Buttigieg felt so strong about this point that he commissioned Maltese graphic designer James Sciberras to paint the chessboard picture adorning the front cover of Of Craft And Honour And A Templar's Chronicles, clearly showing the papal tiara on the same side as the French king but behind, also flanked by the devil Asmodeus and all three facing the Templars with the good shepherd on their side. Incidentally, the black and white floor refers to chessboard mediaeval politics as well as the standard floor of the masonic lodge. Dr Buttigieg is a Knight Hospitaller of rank and has been decorated with the Order's prestigious Commander's Cross. He is also the Republic of Malta's Ambassador to the Sovereign Military Order of Malta (SMOM) and a Councillor to the Holy See. He is well known and respected at the Order's Rome seat of government. Could his attitude be attributed to that of an apologist for the Catholic Church? Dr Buttigieg denies any hidden agendas in his books, and mentions the fact that he portrays Pope Clement V as a figure not particularly worthy of the seat of Peter, as an example. The arguments which follow his stance, which does oppose modern and fanciful concepts about Christ, are derived through logical reasoning if one accepts that there was no wholesale rejection of the Faith by the Templars and based on history, refusing to accept anything beyond that. In all fairness, he does not take sides but in the chapter entitled A Knight Hospitaller's Comments About The Knight Templars he does let rip about these airy fairy theories and their implications.